It was pretty funny and he kept giggling the whole time. What a funny little man we have. 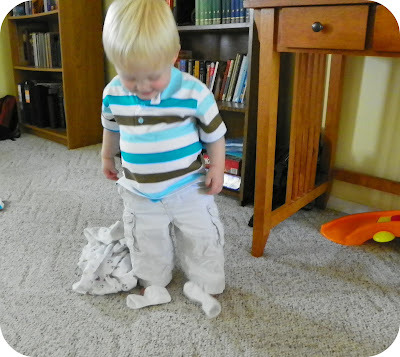 Collin does this too! We'll say "Go get Mommy's socks/shoes," and he'll place them right on top of my feet! We does it with my husband's giant steel-toed work boots (gotta love having an engineer in the house!) too. 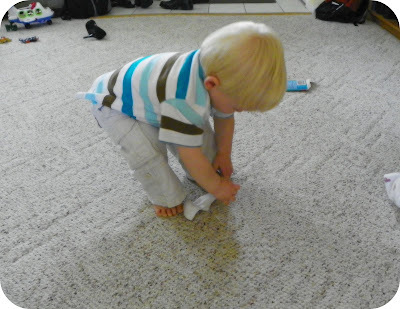 Of course he does it with his own things too, but I love when he brings me my shoes. Sometimes he'll do it just to tell me he wants to go outside. Isn't this age fun? Thanks for sharing. I love seeing little kids personalities shine through in the little things they do.